UU A Way Of Life: Bombed Maria going from Nagasaki to Guernica - Where are the Americans? Bombed Maria going from Nagasaki to Guernica - Where are the Americans? A Marian statue, damaged during the atomic bombing of Nagasaki, Japan, is set to meet its counterpart in Spain as part of a "peace pilgrimage" marking the 65th anniversary of the bombing. 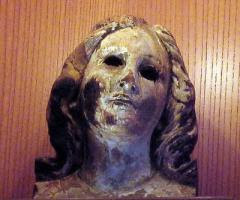 The two-meter-high statue, known locally as "Bombed Maria", which was shipped from Italy in the 1930s, was damaged when Urakami Cathedral was destroyed during the atomic bombing of Aug. 9, 1945. The head was later found amid the rubble. Archbishop Mitsuaki Takami of Nagasaki, who will lead the pilgrimage to Guernica, Spain, in April said: "I learnt that Guernica was the first city in history to suffer from [carpet] bombing. In the process of contacting the people there, I also learnt that there is still the head of a Madonna statue found in the rubble of a church destroyed by the bombing in 1937. We also have one here. It is incredible." Guernica, in the Basque region of Spain, suffered heavy damage during the Spanish Civil War when it was bombed by German and Italian bombers on April 26, 1937. The bombing became the subject of one of Pablo Picasso's most famous paintings. "Peace can never be created by violence," Archbishop Takami said. "The abrogation of nuclear weapons has not progressed very far. My close relatives were killed by the atomic bomb too … I hope the pilgrimage not only lets more people know about the suffering caused by the atomic bombing, but it also becomes an appeal for peace using non-violent methods." God is busy elsewhere, confronting satanists at the environmental center and homosexuals in the coffee shops.